Our Holidays Greetings are brought as the intentions of the Shin-Pyu ceremony. May this help us in building our future in general and 2011 in particular. This Shin-Pyu image shows the most important moment in the life of this young Burmese boy. Shin-Pyu is the initiation ceremony as a novice in the order of monks. He will stay from his 12th – 15th for approximately 5 years in the monastery. During these years he will be taught the normal school elements. But in principal the Buddhist way of life. This consists of the four noble truths: 1) life is suffering, 2) the cause of suffering is desire, 3) end suffering by giving up desire, 4) the way is the eightfold path. This is the so-called Middle Way consisting of 3 aspects of Buddhist practice. Wisdom (right understanding, right intention), ethical conduct /morality (right speech, right action, right livelihood)and mental discipline (right effort, right mindfulness, right concentration). And they are happy and have a pleasant youth. 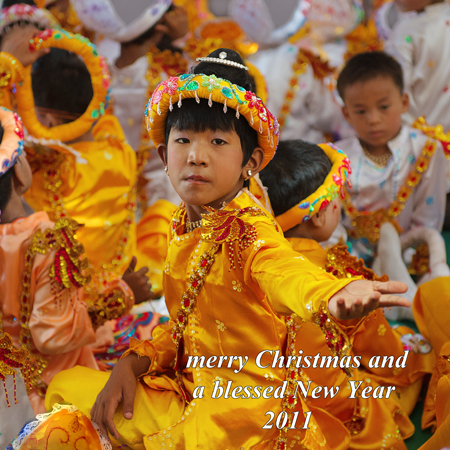 Merry Christmas and lots of happiness in 2011! PRETTIGE KERSTDAGEN EN GELUKKIG NIEUWJAAR VOOR DE HELE FAMILIE!!! Vanuit een regenrijk Nice,’n heel aangename Kerst gewenst !!! Ook van Ludmilla,Casper en Mateo. Ook voor jou en je familie hele fijne feestdagen en bovenal heel veel gezondheid ! Hele fijne feestdagen voor jou en je gezin. Very nice photos and athmosphere. So you see how our parents without all this knowledge tried to educate us and defenitely the result isn’t that bad. 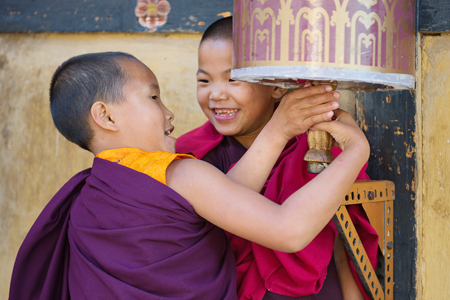 If they were wellknown and familiair with the wisdom of these monasteries, how we should be now on our age. We’ll never know………………..
Merry Christmas and best wishes for 2011 and later with good health, all the luck and happines of the world, at least a part of it. Go on with this level of photography. Of course our wishes are for Ilwa and the family too. From Bali we wish you all the best. I enjoyed your images very much, whilst relaxing on a sofa during a hot evening. Ook voor jou hele fijne Feestdagen toegewenst en dat het allerbeste wat 2011 in petto heeft voor jou mag zijn…..
Jij ook de allerbeste wensen. Echt mooie blog met prachtige foto’s. Ga je goed en veel inspiratie in 2011. Bedankt. Laten we proberen mekaar in 2011 ergens te treffen. Ook voor jou, Erny, Ilwa en verdere familie alle goeds in 2011. En voor jou: een geslaagd fotografiejaar. Daar doe je ons een groot plezier mee.